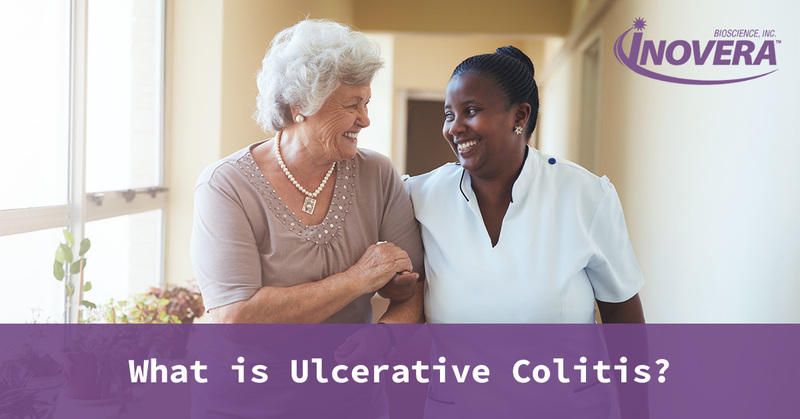 Ulcerative colitis (UC) affects about 900,000 people in the United States, and it is more common than Crohn’s disease. At its base, it is a type of inflammatory bowel disease (IBD) that impacts your large intestine, or colon. Researchers and doctors have not pinpointed the cause of UC, but researchers do understand that UC significantly impacts the lives of those who have it. One of the biggest issues with those diagnosed with UC is the inability to absorb water, vitamins, and minerals in the digestive tract. This condition, called malabsorption, can lead to malnutrition, anemia, and other conditions that result from having UC. If you have been diagnosed with UC and want to make sure you are getting your vitamins and minerals, take a multivitamin specially designed for those with UC and other gastrointestinal conditions. Forvia®, by Inovera Bioscience, was developed for patients with UC and other irritable bowel diseases. Forvia contains the fat-soluble vitamins A, D, E, and K in water-miscible form to enable optimal absorption and efficiency. To learn more about our multivitamin, gives us a call today at 866-619-7705 or visit our website. If you think you might have UC, it is important to consult your doctor for a diagnosis. We provide this guide for informational purposes, and it should not be used in replacement of a diagnosis. The last symptom of UC may be surprising. After a closer look, the root of stunted growth and weight loss is malabsorption caused by UC. A healthy colon has a normal immune system response to bacteria and viruses that may appear in your digestive tract. For people with Ulcerative Colitis, the immune system response in the colon overreacts. As a result, the inner lining of the colon becomes inflamed. Once the lining of the intestines is inflamed, malabsorption begins, causing malnutrition and nutrient deficiencies. The symptoms of ulcerative colitis can be different for each person, and it can develop over time and change. Many people report peripheral symptoms like joint pain and swelling, skin rashes, osteoporosis in the bones, and liver problems. Many of these issues stem from the inability to effectively absorb nutrients. It is important to seek help for your Ulcerative Colitis. Be sure to consult a doctor frequently. Visiting the Crohn’s and Colitis Foundation’s website will also give you access to a host of resources that can help you better understand the disease and seek different treatment options. One important way you can help keep your body healthy and strong is by taking multivitamins for ulcerative colitis. There are specially designed multivitamin and mineral tablets and chews for people suffering from gastrointestinal conditions that result in malabsorption. Forvia Multivitamin and Mineral Tablet or Chewable is a nutritional supplement designed for those with UC and other irritable bowel diseases. If you’re ready to try a nutritional supplement for ulcerative colitis-related malabsorption, try Forvia Multivitamin and Mineral Tablets and Chewables. Visit our website for more information today.